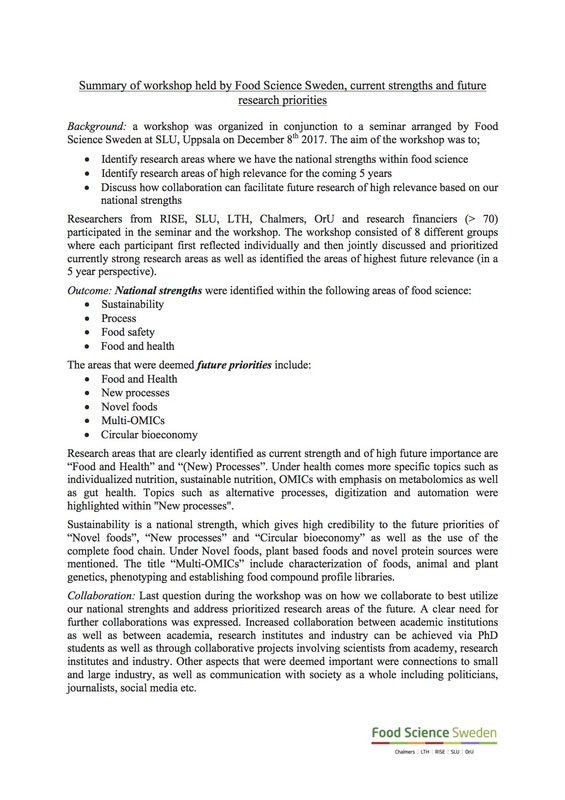 Check out our one page summary of current research strengths and future priorities in Swedish Food Science Research! 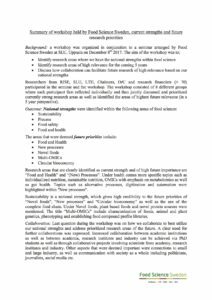 Here is the outcome of the workshop at the FSS Conference on the 8th of December 2017! The summary is based on the current research strengths and future priorities that came up most frequently from the different groups. Please find the result below! The results will be used to strengthen the work of FSS and in communication with for example Livsmedelsarenan (https://tillvaxtverket.se/aktuella-amnen/naringar-i-forandring/arena-for-livsmedel.html) and FORMAS. This document will be “living” in the sense that we will update it yearly at the FSS conferences. The next conference takes place on the 14th of November 2018.